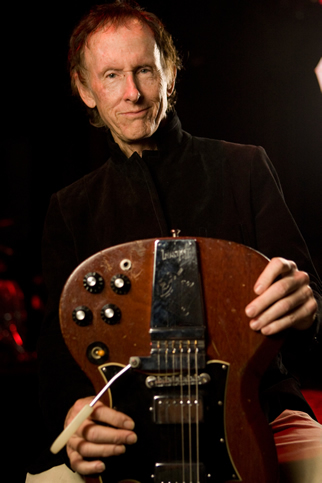 He is listed as number 91 on Rolling Stone’s list of the 100 greatest guitarists of all time. He is also a Grammy nominee this year for “Best Pop Instrumental” for his album “Singularity. His first exposure to music was mostly classical, as his father was a big fan of marching music, but says “Peter and the Wolf” was the first music that really caught him. When he was seven, Krieger accidentally broke his record player, but the radio began to reach his ears playing the likes of Fats Domino, Elvis, and The Platters. While Krieger was attending a private school, there was study time at night that allowed him to teach himself to play the guitar. He began by learning flamenco, borrowing a friend’s guitar. When Krieger was18, he got his own flamenco guitar and took lessons for a few months. He bounced around genres including flamenco, folk, blues, and jazz. Krieger and Manzarek reformed as the Doors of the 21st Century in 2002 with vocalist Ian Astbury, formerly of The Cult. Following a dispute with Densmore over The Doors name, the band is now known as Riders on the Storm. For a brief period, the reformed band also included Police drummer Stewart Copeland. Krieger played guitar on a few tracks by Blue Öyster Cult and has worked on a number of tribute projects organized by Billy Sherwood. In recent times, Krieger has made some guest appearances with the band Particle and appears on the album Transformations Live. Together, they cover many of The Doors’ songs. Krieger has participated in the “Experience Hendrix” series of concerts over the last two years (2008-09), joining a number of high profile guitar players paying tribute to the musicianship and songwriting of the late Jimi Hendrix.